South Sudan is a typical example of modern day media saturation, there are only so many cries for UN intervention, only so many pleas for aid and only so much bad news people can absorb before saturation is achieved. Since independence and the follow South Sudanese civil war and various famines there has been so much negative coverage that one has no hope of keeping track. So what is the situation at the end of 2017? The 2015 ceasefire marked a period of uneasy semi peace; there were multiple violations of this agreement. At the end of 2017 the country has an inflation rate of a massive 835% and such a meagre harvest that twice as many people in the emergency phase, pre famine that the same time last year. With an estimated 4.8 million people in need of humanitarian assistance it is impossible to not wonder how earth did South Sudan end up in this situation. South Sudan has a relatively short history. In fact, it is the youngest nation state on earth, having only gained its independence in 2011. South Sudan has succeeded in gaining the international recognition that is so decisive for newly emerging states; in July 2011 they joined both the United Nations and African Union. However, this is one of the few successes of an incredibly tumultuous and short existence. The history of Sudan is largely as one might expect, beginning with tribes inhabiting the region and engaging in conflict against each other, which is really a tale as old as time. However, while Islam managed to penetrate the north of Sudan, geographical barriers to the south prevented its further spread. The more powerful Egypt began to take control of the north of Sudan from 1821 and made forerays to the south. In the 1880s and 1890s the British began to exert control over the area. British forces invaded the Sudan of Mahdi and as they did in other areas of their empire, began implementing their colonial will, policy and British officials on Sudan. In fact, the British joined forces with the Egyptians and took Sudan by force, naturally aided by their technological superiority. The Anglo-Egyptian system of control was also largely as one might expect. Typical British colonial institutions were imported and there were some advantages in the form of disease control etc. Moreover some trade and export were established, this trading regime was naturally joined by an attempt to Christianise the locals, with all the oppression one might expect from such endeavours. Together Egypt and the UK were successful in ripping up much of the country’s cultural roots, social harmony and in creating a new hierarchy with extractive institutions. After revolting against the external, colonial, control of their nation – a story familiar to many decolonising nations played out: a civilian government fell victim to a military coup. This was to be just the start of the conflict in Sudan. The civil war which began in the South in 1962 did eventually lead to a measure of self governance under the Addis Ababa peace agreement of 1972, but it was not full independence and the decade of conflict left considerable scars. The discovery of oil in the South in 1978 did not help to unite the nation of Sudan, neither did it provide long term stability or prosperity, in fact it drove a further wedge between the two parts of the country. The following decades involved coups and terrorism as well as multiple incursions on Sudanese soil by rebel groups from bordering nations. However, after all these decades of unrest and continuous strife South Sudan was declared independent in 2011 following a referendum. However, civil war and civil unrest dogged South Sudan before independence, and it was no different once independence was achieved, even if the causes may have differed the result did not, and the suffering of the Sudanese people continued. Like much of Africa, and to various extents other developing parts of the world, South Sudan suffered from a lack of quality political institutions or centralisation in a modern state (with the appropriate checks and balances). Instead elites and the military were able to plunder most of the profit from the discovery of oil, even this in itself might not have led to state breakdown and ethnic conflict. However, not even the military was centralised and controlled in anything like a professional manner, rather it was a disjointed group of militias. It is in the context of colonialism, ethnic division, history of civil war and failure to build a modern centralised state that the human rights violations have taken place. South Sudan’s latest civil war which began in December 2013, when soldiers loyal to President Salva Kiir, a Dinka, and those loyal to former Vice President Riek Machar, a Nuer, fought in the capital following months of growing political tensions, has caused serious abuses against civilians by both government forces and opposition fighters despite a peace agreement signed in August 2015. 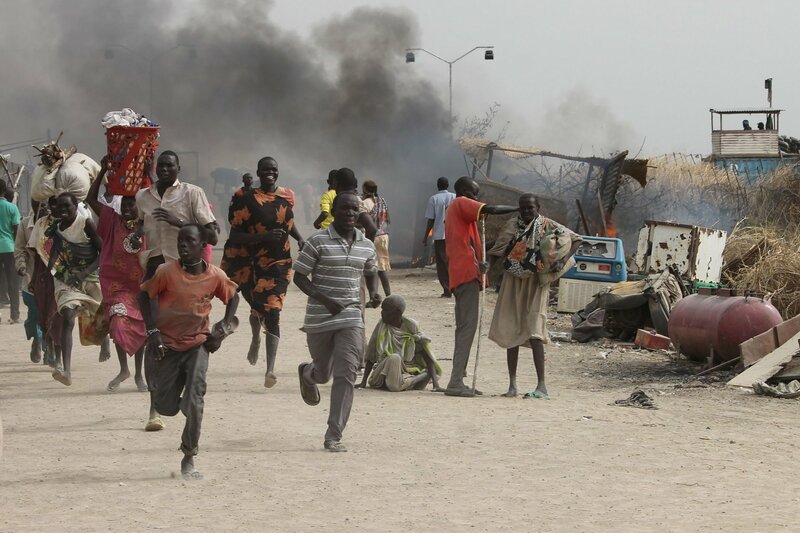 Government soldiers reportedly killed, raped and tortured civilians; destroyed civilian property during counter insurgency operations in the southern and western part of South Sudan. Both sides committed abuses against civilians. More than 2.1 million people have crossed into neighboring countries including Sudan, Ethiopia, Kenya and Uganda, resulting in Africa’s largest refugee crisis. Inside South Sudan, more than 1.8 million people are displaced. The United Nations Commission on Human Rights in South Sudan reported in September 2017 that it has witnessed tens of thousands of South Sudanese women and children arriving in Ethiopia in a week, after walking in some cases for months to reach safety. Hundreds of thousands of others civilians over were subjected to collective punishment by government forces, based on ethnicity and their perceived support for the opposition. About 70% of women who were sheltering in (these and other) camps had been raped since the beginning of the conflict, with the vast majority of rapists being police and soldiers. Human rights violations have included UN refugee camps being shelled; a sharp increase in the number of reported incidents of child recruitment; restrictions on the freedom of expression in the form of the arbitrary detention and torture of journalists; repression of NGOs; disease outbreaks including cholera; and inability to deal with widespread food shortages. The effect of all the instability and insecurity in the country has been devastating on property rights and the private markets in general. However, this effect is felt most drastically with regards to agriculture, an area which South Sudan has notable potential. Without the required rule of law and property right though, there are shortages all around. Little food is available and in Juba, the retail price of sorghum, a staple grain, is 600 percent higher than it was in 2015. Constitutionally speaking South Sudan was initially a Republic with a standard structure and set of institutions. An executive made up of the president and vice president, a bicameral legislature (National Legislative Assembly (NLA) and the Council of States), an independent judiciary with the highest court being the Supreme Court. However, in the context of huge human rights abuses and civil war it is difficult for normal politics to exist. Indeed following the peace agreement of 2015 a transitional government was set up to share power between the current administration and the rebels. This plan went into effect in April 2016 and was scheduled to last for 30 months, with elections to be held 60 days before the end of the transitional period. Importantly, within 90 days of the agreement the National Legislative Assembly was to be transformed into the Transitional National Legislative Assembly. This involve the retention if the members already sitting in the NLA plus a further 68 members, 50 to be drawn from the South Sudan Armed Opposition, 17 from other political parties and 1 former detainee. No changes were made to the Council of States. While this may sound like a positive step towards peace, plans to hold elections in 2018 have prompted Haile Menkerios, the UN secretary-general’s special envoy to the African Union, to comment that elections can only be held when “people are not displaced by violence and hunger and in which they are able to express their political views free from intimidation”. The burning question is why would, what at least appears to be, a fairly standard political system of paper fail so spectacularly. Naturally, it is difficult for a nation to shake of a history of slavery, colonialism and civil war. The conflict with Sudan was not as simple as South Sudan versus the north, in fact some conflict between the rebel groups was inevitable and was encouraged by Khartoum, notably by providing arms to some groups. The personal rivalry between the President, Salva Kiir, and his former Vice President, Riek Machar, has its roots in the latter forming a splinter group, the SPLM/A-Nasir, in 1991. While this personally rivalry is important the issues undermining the political institutions of South Sudan are much more pervasive and run much deeper. Corruption is a real problem and nepotism is equally widespread, particularly ethnic nepotism. This is driven by many politicians relying on ethnic support bases, fearing the loss of power there is a real incentive to reinforce the ethnic divisions of the nation, rather than seeking policies which may unite. This raises the question: will the future be any brighter for South Sudan? There is often a presumption that democracy will be enough to negate ethnic differences and developmental challenges. This has clearly not been the case for South Sudan. Future elections have caused alarm in international circles as potentially unsettling and ethnic voting bases have merely taken the issue of ethnic strife into the new nation’s political structure and system. It is difficult to imagine a change in the recent future. For there to be a change the elites of South Sudan would have to renounce a toxic politics which has enriched them and elevated them to the very position which they are in now. While not impossible it does not seem likely. Therefore, toxic politics is likely to remain, the question is how violent will the result be? It is worth remembering that ethnic voting blocks are a feature of many developed democracies, alone they do not have to result in human rights abuses and civil war. To resolve the human rights challenges a consistency towards peaceful solutions, a joint approach towards healthcare, food security and education are the things local as well as international actors need to focus on. The country is still like a newborn baby, abandoned by parents and stuck between family dispute about ownership, it might take more than we can think of at this point. We are yet to understand if the decision to form South Sudan in 2011 was right or not, while we think and discuss the problems and solutions of this country. Therefore, it is rather a question of handholding and overlooking the development and growth as time passes by. If it is restrained and the human rights abuses can be abated and perhaps be confined to history then there may be hope in the longer-term future. Informative article. News about South Sudan has not attracted media attention for most of the time. The area has been reeling under pathetic health conditions if people and starvation deaths.